What is First Metatarsophalangeal (MTP) Joint Arthritis? 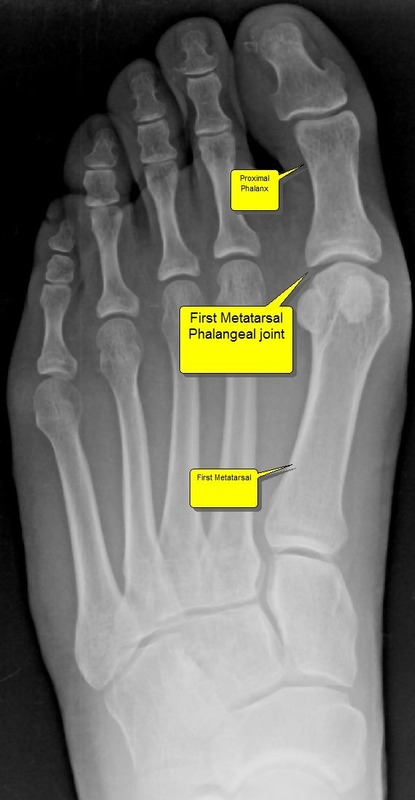 Arthritis of the 1st toe metatarsophalangeal (MTP) joint is the second most common pathology of this joint following hallux valgus, or bunion deformity. First MTP joint arthritis is a progressive degenerative condition, which results in decreased motion of the joint. The exact cause of 1st MTP joint arthritis is unknown; predisposing factors that precipitate this condition include acute injury, such as forced plantarflexion or dorsiflexion (turf toe), stubbing the toe, repetitive microtrauma, fractures into the joint or a crush injury. Congenital deformities of the first MTP joint may also predispose an individual to develop arthritis; these include a short or long first metatarsal, flattened first metatarsal head or an elevated first metatarsal. Onset of symptoms is usually insidious, but may occur after an acute injury. Stiffness of the first MTP joint, as well as pain and swelling of this joint are common presenting symptoms. Pain is often increased with activity. Positions such as squatting, which cause the joint to hyperextend, will also cause pain. For women, high-heeled shoes often cause increase discomfort due to hyperextension and increased jamming of the joint. Pain is often relieved with rest. Patients’ may also complain of pain on the lateral aspect of their foot as they may compensate and weight bear more laterally to decrease the stress on the first MTP joint.